I was looking forward to that morning that comes after a long time of being heart-broken where it all just stops hurting. A landscape shot of one of the most famous sightseeing spots in Greece, right after the sunset. 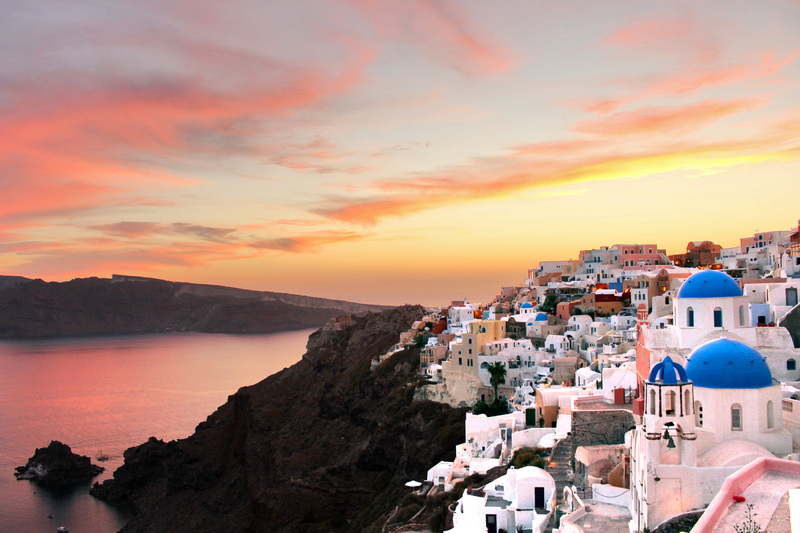 You can see the traditional whitewashed houses and the beautiful colors of the sunset at this special location. We walked across the plaza filled with people and I found myself where the real nightlife was happening – a Souvlaki shop where no English was on the walls, or in the air. I smiled at the counter like a kid in a candy store. This good looking man ordering for lil ol’ me?! Normally I’d hate that sh*t, cause I’m an independent woman and can order for myself, but everything is cuter with an accent. Was it a crock of Sh*t? Maybe. Did it make one hell of a story? You better believe it.